It’s no secret that I love, and use, Ulysses all day long — nor is it a secret that I publish with WordPress and only use iOS. This storm of factors means that I have a very specific set of requirements to make a dream writing app, and The Soulmen (the company behind Ulysses) asked me what I still yearned for in their app. The above features were at the top of my very short list. I’ve known typewriter mode was coming, but I thought I would never see WordPress support at this level. When you run a WordPress site, like the one you are currently reading, what you may not realize is the amount of custom ‘magic’ and hacks that are applied to make things work as they do. It’s nothing unstable or difficult, but it does add to the complexity of publishing. Which is why Workflow is such a godsend — as even the native WordPress iOS app can’t publish a link list post to my site. But Workflow isn’t easy to both setup and use to publish, it’s a hack — albeit a really good one — but still a hack. The Ulysses team reached out to me and asked what I would need for WordPress publishing to be complete, warning me I wasn’t likely to get any of it. Fair enough. Then they sent me a new build and, well, they’ve made the most elegant WordPress publishing system I have seen to date in any app, Mac or iOS. To understand what and why this implementation is so good, I need to show you the complexity of my publishing as an example. For the longest time I had to set all these fields manually or by copying and pasting every time I published. It was tedious and error prone. On my Mac I solved this with scripting. Viticci finally helped me solve this with Workflow and made my input minimal, but still not ideal. Linked list URL: make the title a link, it grabs that link. From there, the rest of the fields for post formats, dates, and publish status can be set manually and will carry across with those settings each time you publish. This all works really well. You can choose to have the text sent as Markdown, instead of HTML conversion happening. You can tell Ulysses what to do after publishing with the current options being: open post edit screen, view post, or nothing. This is very neat as you can have Ulysses directly launch the WordPress backend, into the post you just published, so that you can make more tweaks there if you want. Publishing to WordPress is cumbersome, but Ulysses makes the process as seamless and elegant as possible. It supports featured images and more. It took me one try to get used the the publishing flow, and from there I have yet to look back. When apps first started coming out with Typewriter modes (where just the line of text you are writing is highlighted) I was immediately drawn to it. Most apps set the active line in a fixed location on the screen/window for the app — and most of the time this is workable — but it is far from ideal. When Ulysses introduced the variable type writer mode I couldn’t stop smiling. This mode has now come to the iPad and it works flawlessly. Quickly toggled with a keyboard shortcut, the typewriter mode is the feature I have been yearning for. When on, you can scroll the active line of sheet to wherever you want, and the sheet will stay right where you put it, as you pour words on to the page. Perfection. This is such a seamless and well executed feature — I had really been missing it on iOS. There’s plenty more additions to Ulysses Mobile, but those two are stand outs for me as they complete my checklists of needs from the software. 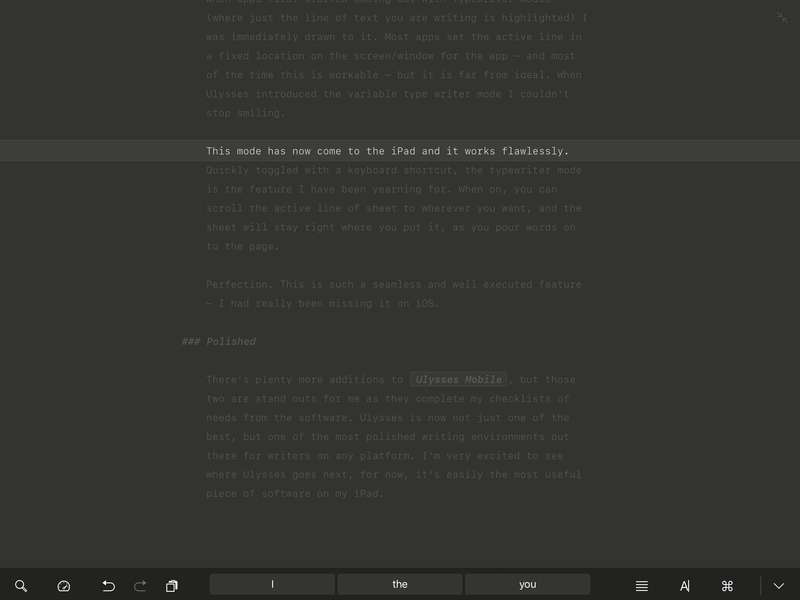 Ulysses is now not just one of the best, but one of the most polished writing environments out there for writers on any platform. I’m very excited to see where Ulysses goes next, for now, it’s easily the most useful piece of software on my iPad. The best keeps getting better, on its way to perfection.